Digg has introduced a bar above the header section of a website which allows you to digg the article from that blog or website without leaving the page. Here we will talk about each and every option provided on the Digg bar. You have already seen “Stumbleupon Bar”, but the features and options provided here are different than Stumbleupon bar. Whenever you will open a submitted post from Digg website, it will direct you to a new page with the URL something as “http://digg.com/d1sowk” which is nothing but the same article you clicked on the Digg page with a Digg Bar at the top of the page. 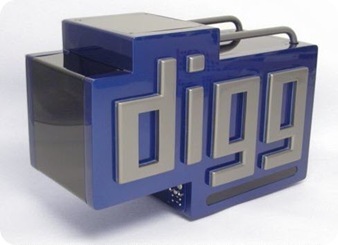 First link on the digg bar is for the Digg home page which is “http://www.digg.com”. You can land on the home page of digg at any point of time. You can see the number of digg for the article you are browsing right now. If you will click on the number, it will direct you to the same post on Digg website. Here comes the digg it button by clicking on which you can just increase the digg number of that post. You dugg the article or post. The most important thing of Digg bar is that you will not leave the page. So don’t worry about leaving the page, you can browse that website and digg another post from there only. You can see the number of comments for that particular post on Digg. If you will click on that, it will again direct you to the same article page on Digg website. You can see the direct link of the website or the article. You can move to the website by leaving the Digg bar at any point of time by clicking on the direct link to the page or website. If you want to categories a post as a Spam or Duplicate story then do that by clicking on the Bury. But if you have already “Dugg” that post, you will not see the Bury button on the bar. The bury button will be converted into “Favorite” button. Check for the other posts from Digg.com which are having the same keyword and they might interest you. Once you will click on the “Related” button, it will open a small frame at the bottom of the bar which will have some links of related pages. You can hide the frame at any point of time by clicking on the “hide” button provided at the bottom of the frame. Check other posts from the same website which are already “Dugg” by someone else. You can also “Digg” those link and share them with your subscribers. Browse random posts from Digg by clicking on the “Random” button, Again it will show you some random posts in the same frame opened on the page. An email button is provided by which you can send the article to your friends or fans. The link sent thru this email option will be the same link on you are currently active. Which means the digg short link of the post (with digg bar). Share the same link on Facebook to let your friends know that you are reading something interesting. Share the same link on twitter. Remind you, this is now the direct link of the post. This is the short link with digg in URL which will direct the followers to the post with digg bar. Digg team has created a survey form on surveymonkey.com where you can answer some of the questions related to the Digg bar. You can choose to close the Digg bar button at any time and that will direct you to the original link of the post.